With this two-part series, you get to choose your own adventure! Below you can read the tragic subplot of The Dark Knight—Harvey Dent’s storyline. Then, to see how Batman’s arc is built around it, read the encompassing plot. If you want to start with Batman’s story or read through the full plot chronologically, here’s the heroic storyline. You can jump from one post to the next at any time by using the teleport links. Villains are the heroes of their own stories. In The Dark Knight, Harvey Dent goes through the 8 C’s just like protagonist Bruce Wayne, with just two alterations. Instead of an Allies and Abilities section after the complication, Harvey gains enemies and displays his tragic flaws. And since Harvey’s story ends tragically, his seventh C isn’t a curveball that sets him back; it’s a final burst of confidence. When the new DA gets wind of this, he’ll want in. Be hard to keep him out. I hear he’s as stubborn as you. For comic book fans, Harvey’s captivation comes when he pulls out the coin to flip for who will lead in the courtroom and Rachel calls him Harvey. DC fans know that Harvey is Two-Face’s real name, and coin-flipping is his trademark, so once he’s introduced, they automatically know who he is and whom he becomes. I’m serious, Harvey, you don’t leave things like this to chance. I make my own luck. Clearly Harvey Dent is the heroic type, right? Fancy stuff for a city cop. Have help? Save it, Gordon. I want to meet him. Official policy is to arrest the vigilante known as Batman on sight. As soon as Harvey partners with Gordon (and consequently Batman), Harvey’s story begins to change. We’re going after the mob’s life savings. Things will get ugly. I knew the risks when I took this job, Lieutenant. Same as you. plays Russian Roulette with the thug, then tosses his coin for the thug’s life—but in both of these cases, he’s bluffing. 549 criminals at once?! 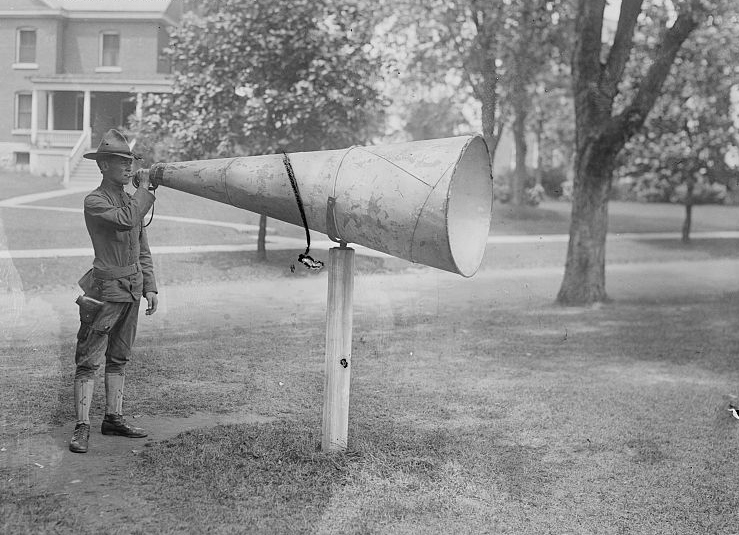 How did you get Surrillo to hear this farce? She shares my enthusiasm for justice. After all, she is a judge. Second, we see what he has to lose. You’re the symbol of hope that I could never be. Your stand against organized crime is the first legitimate ray of light in Gotham for decades. If anyone saw this, everything would be undone—all the criminals you got off the streets would be released. This next scene is definitely the midpoint. It happens dead center of the movie, and it’s a major turning point in the plot. Harvey tells the press that he is the Batman. Perhaps both Bruce and Mr. Dent believe that Batman stands for something more important than a terrorist’s whims, Miss Dawes, even if everyone hates him for it. That’s the sacrifice he’s making—to not be a hero. To be something more. This harkens back to the conversation between Rachel, Harvey, and Bruce back at the restaurant, when they were talking about a Roman guardian of a city doing it not for honor, but as a public service. The ensuing car chase with Dent in an armored car, acting as bait to catch the Joker, seems like it shouldn’t be any sort of Elation sequence, but Dent is actually enjoying it—in the script, as well as in the movie, Dent is smiling and calm amidst the gunfire and chaos. He is pleased. And then Batman, Gordon, and Dent catch the Joker. Elation. So of course the collapse comes next. Dent is captured and brought to a warehouse to die or be rescued. So is Rachel. They’re each given a 50/50 chance to live, because they know Batman will only be able to rescue one of them. Harvey tries to move but falls, accidentally dousing the left side of his face with gasoline. Batman, thinking he’s gone to where Rachel was, shows up to Harvey’s warehouse. Harvey is helpless as Rachel is blown up. On the way out of the building, as it, too, explodes, Harvey’s face catches fire. Harvey wakes up in the hospital and finds his coin—the one he’d given to Rachel—at his bedside. Half his face is destroyed. One of the faces of the coin is damaged, too. Gordon visits Harvey and tells him he’s sorry. No. No you’re not. Not yet. The Joker finds Harvey in the hospital and releases him from his restraints. The Joker says Gordon and the mob are all schemers, and that Harvey used to be a schemer, too, but he (the Joker) is an agent of chaos … because chaos is fair. Harvey pulls out his coin. Now it’s not a lucky coin. He can’t make his own luck anymore. His agency was taken away by chance. Now chance will govern his decisions. Dent looks down at the coin in his hands. Turns it over, feels its comforting weight. Shows the Joker the good side. He turns the coin over. The flip side is deeply scarred. After chance dictates the Joker’s fate at the hands of Harvey, Harvey—as Two-Face—goes on a murderous rampage, targeting everyone who was tied to Rachel’s death and flipping his coin to decide if he kills them or incapacitates them. His first victim is Detective Wuertz, who had picked him up and brought him to the warehouse. Next he visits Maroni, the mob boss, who tells him the name of the cop who picked up Rachel and brought her to her death. Harvey forces Ramirez to betray Gordon’s family, tricking them into meeting where Rachel was killed. Lt. Gordon shows up to the place where Rachel died to find his wife and children huddling together. Harvey disarms Gordon. Chance might be the judge determining someone’s fate, but Harvey is still a prosecutor. More than that: now he decides who should be on trial. He’s got Gordon exactly where he wants him, especially after he puts his gun up to the head of Gordon’s little boy. Harvey is confident that Gordon is going to get a “fair” trial. Then Batman shows up, and it’s time for Harvey’s final exam. You don’t want to hurt the boy, Dent. It’s not what I want. It’s about what’s fair. You thought we could be decent men in an indecent world. You thought we could lead by example. You thought the rules could be bent but not break … You were wrong. The world is cruel. And the only morality in a cruel world is chance. Unbiased. Unprejudiced. Fair. Remember when Harvey was boasting about the judge being enthusiastic about justice? For Two-Face, justice means retribution. Justice is punishment. And if he was punished (losing Rachel, burned half to death) when he was doing good (trying to take down the mob), then his punishment must have been determined by chance. The scariest villains are the ones we empathize with. The ones whose motivations kinda make some sense. …and Batman takes him out. Two-Face is dead. For Harvey’s resolution, we need to go to Bruce Wayne’s side of the story. 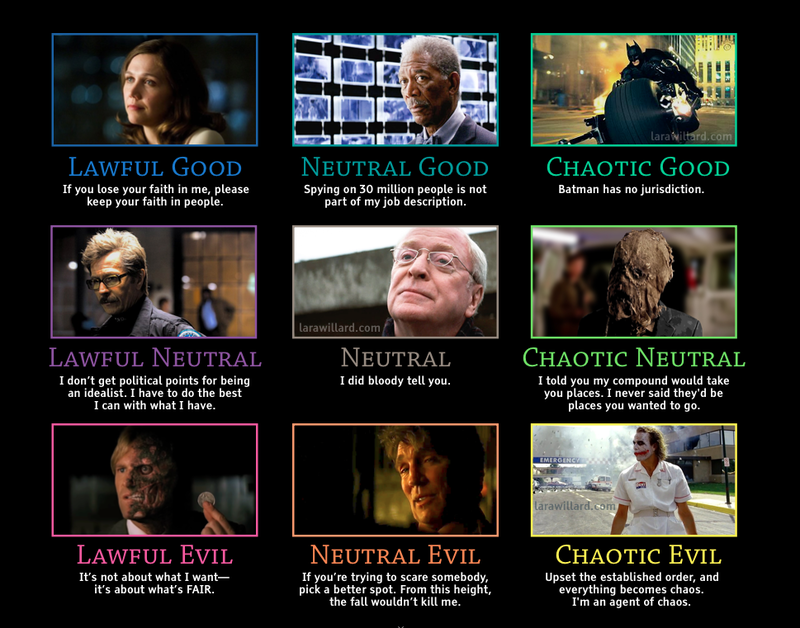 I spent WAY too much time creating this graphic of my D&D alignments for the characters in The Dark Knight. So, did you read chronologically? Did you choose the heroic or tragic tale first? It’s been a while since I’ve done a good ol’ fashioned story deconstruction here on the blog, and what better story to do it with than The Dark Knight, which has not one, but two sequences of the 8 C’s? I’ve been asked a couple of times about how the 8 C’s of Plotting would work in a tragedy setting, and The Dark Knight is one example of how the 8 C’s can work for both tragic and heroic storylines. If you haven’t seen The Dark Knight, you might want to do so before you read on, because here be major spoilers. Captivation—what gets the audience interested in the character or predicament the character is in. Followed by the “Opening” sequence. Change—the inciting incident that sparks the story engine. Followed by the “Reaction” sequence. Confrontation—the first confrontation between the protagonist and whichever antagonist or idea s/he will be facing off against in the Final Exam. Followed by the “Elation” sequence. Collapse—the near-fatal blow to the protagonist. Followed by the “Gloom” sequence. Comprehension—the Awakening, either figuratively or physically. When all hope seems to be lost, the Hero learns new information, regains consciousness, or gets help from someone or -thing. Followed by the “Action” sequence. Culmination—the climactic moment. Either the hero wins, or the hero dies (figuratively or literally). Followed by the “Resolution” sequence. *Harvey’s Tragic story follow these same C’s, with two alterations. Look, titles are tough. We think writing synopses, query letters, or back cover copy is hard. But try distilling your entire book into a handful of words, and you might come up with a long list of duds before landing that final good one. So here are some tips for choosing a long list of preliminary titles for your book. I claim without reservation that Lin-Manuel Miranda is Shakespeare 2.0. The composer/playwright/actor is heavily inspired by Shakespeare, which is evident in his Pulitzer-Prize Winning Hamilton, a strategically constructed historical tragedy. Each of the three primary characters in Hamilton has an armature, a theme which progresses through repetition and reversals to give each their own character arc. After just one listen-through, I had five single-spaced pages of notes. If you were wondering why I haven’t blogged in a while—it’s because I’ve been trying to decide which motifs to highlight. It’s because after taking my own notes, I’ve spent hours on Genius reading the annotated lyrics. Obviously this post will be filled with spoilers if you don’t know Alexander Hamilton’s historical fate. I highly recommend listening to the full soundtrack, whether before, during, or after reading the following insights. Do note, however, that the lyrics are explicit and as such are likely not appropriate for children or work. First let’s start with the most prominent motifs; then we’ll look at the primary arc for Eliza, Burr, and Hamilton.